Are you between the ages of twenty and forty? If you’re not currently employed, odds are you are either currently in college or are thinking about going to or even returning to college. If you are between twenty and forty years of age, congratulations, you’re a young adult. More young adults are enrolled in college today than at any time in recorded history. Touch economic times make staying in college or returning to college one of the better options as it means that you are obtaining skills and knowledge in areas that will help once you graduate. However, along with those enrollment numbers climbing, college costs are also on the rise. Financing options seem to be limited as federal student aid is behind on average. The lack of loan or grant options means that most college students are struggling with student loan debt. What do you owe on your college education? On average a college graduate can expect to leave school nearly $20,000 in debt. 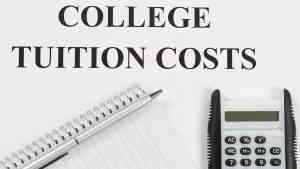 The U.S. Department of Education has made available an online tool to help identify which colleges have the highest and lowest tuition net prices. The College Affordability and Transparency Center is able to generate a report on the highest and lowest (top 5 percent and bottom 10 percent respectively) academic year charges for each sector. Their tuition reports include tuition and required fees and the net price is the cost of attendance minus any grant and scholarship aid. The data available at the College Affordability and Transparency Center are reported by institutions and are for full-time beginning students. Going to or returning to college is a growing trend among those who are unemployed. The rising costs of a higher education mean that you either can’t afford to attend or you graduate with an average of $20,000 in debt. Your options with federal student aid are limited. Where can you find the money to pay for the education you need or to pay off your student debt? AmOne can help you identify the right financial solutions for your needs. Our knowledgeable associates are ready answer your questions on personal loans, unsecured loans, debt consolidation, and more. AmOne offers solutions; your call to us is free and we won’t try to sell you anything. Find out how to reach us and learn more about how AmOne can help you today.